In addition to teaching and performing belly dance, Michelle is a posture coach who has appeared on TV shows across the country as an expert in the field. She has a book and a video series designed to help people change their bad posture habits. More info here. Formerly a social worker, Michelle has used her counseling skills to develop workshops that help dancers to overcome stage fright, body image issues and and creative blockages. Michelle promoting her book on TV in Los Angeles. 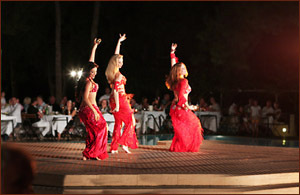 Michelle on the ABC show "View From The Bay"
at Club Med on the Turkish Riviera in 2006. 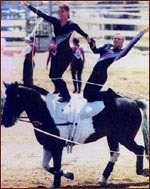 Michelle doing gymnastics on horseback (she is on the left). 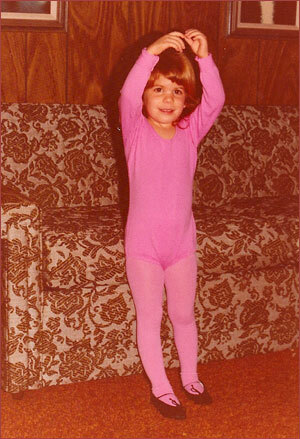 Baby Michelle shows off her Ballet.